The riveting true story of Japan's top secret plan to change the course of World War II using a squadron of mammoth submarines a generation ahead of their time In 1941, the architects of Japan's sneak attack on Pearl Harbor planned a bold follow-up: a potentially devastating air raid--this time against New York City and Washington, DC. Unfortunately, due to sales rights restrictions, we cannot offer Operation Storm for sale in your country. • The true story of Japan's top secret plan to follow-up to Pearl Harbor with an attack on NYC and Washington, D.C. using a squadron of aircraft carrying submarines. The riveting true story of Japan's top secret plan to change the course of World War II using a squadron of mammoth submarines a generation ahead of their time In 1941, the architects of Japan's sneak attack on Pearl Harbor planned a bold follow-up: a potentially devastating air raid--this time against New York City and Washington, DC. The classified Japanese program required developing a squadron of top secret submarines--the Sen-toku or I-400 class--which were, by far, the largest and among the most deadly subs of World War II. Incredibly, the subs were designed as underwater aircraft carriers, each equipped with three Aichi M6A1 attack bombers painted to look like US aircraft. The bombers, called Seiran (which translates as "storm from a clear sky"), were tucked in a huge, water tight hanger on the sub's deck. The subs mission was to travel more than half way around the world, surface on the US coast, and launch their deadly air attack. This entire operation was unknown to US intelligence, despite having broken the Japanese naval code. And the amazing thing is how close the Japanese came to pulling off their mission. 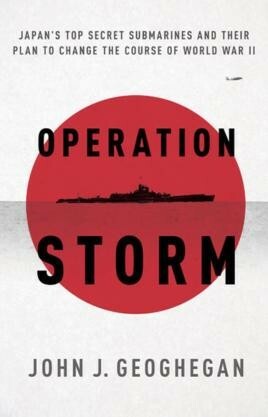 Meticulously researched and masterfully told, Operation Storm tells the harrowing story of the Sen Toku, their desperate push into Allied waters, and the dramatic chase of this juggernaut sub by the US navy. Author John Geoghegan's first person accounts from the last surviving members of both the I-401 crew and the US boarding party that captured her create a highly intimate portrait of this fascinating, and until now forgotten story of war in the Pacific.